Alex completed her Bachelor of Business degree, majoring in Event Management and Marketing in 2018. Whilst studying, Alex’s passion for events developed through knowledge and skill growth of the industry. Her experience in hospitality only grew her love for a well organised event, developing a keen eye for detail. 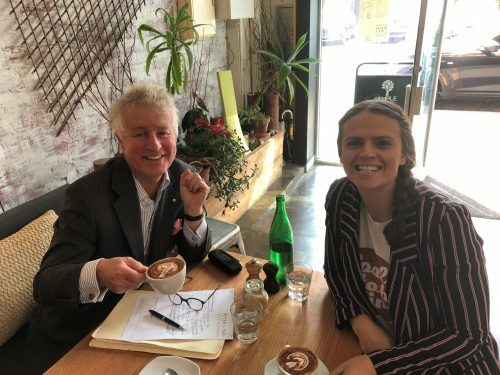 Peter sat down with Alex to talk all things events and coffee for this “White with one” – staff edition. Soy cappuccino with one sugar. I have one a day and if I have another, it’s a decaf. Back in my Uni days I would drink three a day – two of those were to keep me awake while working in hospitality. Peter: How did you become interested in event management? It goes back to my high school days, where I was always the one in charge of organising my group of friends. I actually started studying psychology but realised pretty quickly it wasn’t for me, so I moved on to do an event management degree and graduated last year. It was taking on events for my church that made me interested and made me realise that I could do this day in and out! I also spent two years working with the Marriner Group, so I saw plenty of events. Peter: In your short time at PJSE, what have been some of your proudest moments/highlights so far? Being involved with the Pre-Race entertainment at the Melbourne Cup and having Sam Smith perform was certainly one. Also, my first event with Mazda and the response we got from everyone involved – I wish all guests were as appreciative of what was done for them as this group. The Australian Open – I go every year. I can remember as a child driving from Adelaide to Melbourne with my parents just to see the tennis. I’m also a big fan of the Night Noodle Market. Peter: What are some of the best things about living in Melbourne? Definitely our coffee culture, as we are spoilt with so many options. I also love the fact that you can do so many different road trips within a few hours drive and see everything Victoria has to offer. Peter: What is your favourite café? Definitely Maker in Richmond. While I was studying, I virtually lived there! Peter: Who are some of your most admired Melburnians? Maryanne Shearer, who founded T2 here in Brunswick is definitely one. It’s amazing how such a simple idea can turn into such a large, successful business. Peter: If you could attend any event in the world, what would it be and why? I’ve always wanted to go to the Christmas market in Bath in England. They even have an ice rink there. It’s definitely on my bucket list! Peter: What has surprised you most about the events industry? Having worked on the banquet side of things, now I get to see all the other elements that go into putting an event together. Knowing the broader vision of an event and considering all of the different components is something that has been a learning experience as one small change can affect so many other details. Peter: Alex, thank you for your time today and keep up the good work.